All About: POWER-LINE and ELECTRICAL INTERFERENCE with New insights into causes & effects, and locating & correction of interference sources. 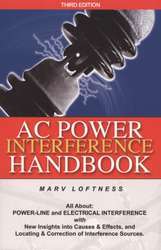 "This easy to read, very practical book, is a must for anyone responsible for solving interference problems. "-Vern Chartier, past chairman, IEEE T&D Committee. 3rd edition, revised. © 2007, by Percival Technology. Distributed by American Radio Relay League, Inc.